The first wedding we photographed in Los Cabos was at Esperanza. Like the bride and groom and all their guests, we were stunned by the luxury beachfront resort and the natural beauty surrounding it. Since then, we have photographed dozens of couples celebrations at this beautiful resort and each and every time, we find something new to love! The beach at Esperanza has a wildness about it; though the incredible view of the Arch remains the same, the light, the wind, and the waves are always different. I think being newly married there and walking together barefoot on the sand as the waves crash and the suns sets must be one of the most romantic and exhilarating feelings in the world. We created this relaxed wedding photo after the couple exchanged their vows on the beach at Esperanza with waves crashing behind them. After the ceremony and family photos, the bride and groom wanted to enjoy a few moments alone together to bask in the glow of being newly married! They got comfortable on the beach daybed and talked about their favorite moments during the ceremony. Even from a distance, you can see the happiness in their smiles and their connection. 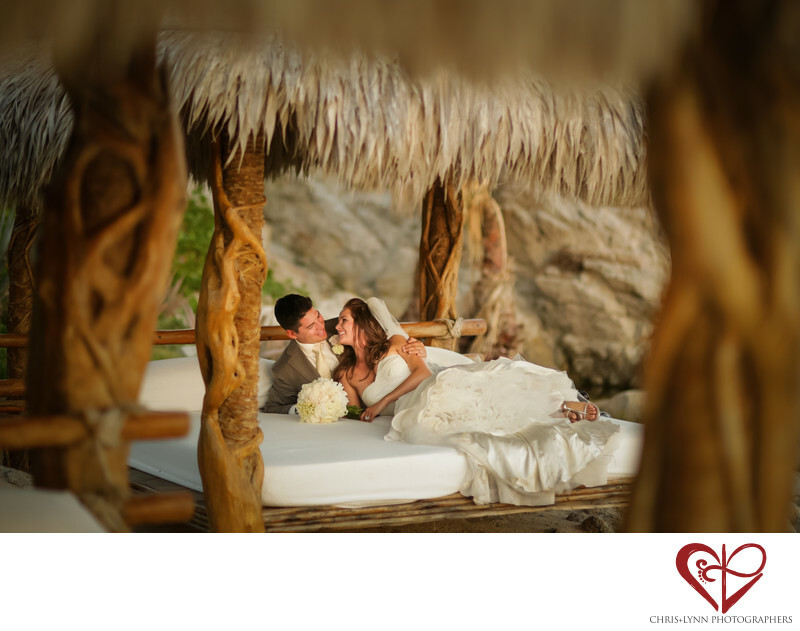 I love how the palm fronds and palm tree bed posts frame the couple and add a tropical feel to this image. 1/1000; f/1.4; ISO 800; 85.0 mm.